Looking for a unique fundraising item? How about something new to serve in the cafeteria or your restaurant? 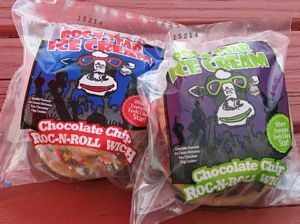 Our Roc-N-Rollwich ice cream sandwiches are the perfect choice! We offer two varieties – creamy vanilla ice cream edged with rainbow sprinkles or rich chocolate ice cream finished with chocolate sprinkles. Both are sandwiched between two fresh homemade chocolate chip cookies. Our Roc-N-Rollwiches are currently offered in 26 area school cafeterias, at Mario's in Oriskany Falls, and right here in our own restaurant at 268 Sanger Avenue in Waterville during the ice cream season and by calling to order during the winter months. We also offer a great and unique fundraising opportunity for area schools and organizations. Break away from the usual fundraising items and offer your supporters a sweet treat with Roc-N-Rollwich ice cream sandwiches! Contact us for more information on ordering or fundraising opportunities.